This technical report covers series, shunt and compound wound motors of two standard enclosure types: TENV (totally enclosed nonventilated) and TEFV (totally enclosed forced ventilation from a separate source). 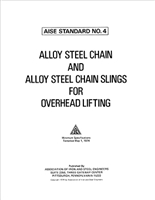 This standard is intended to serve alloy steel chain users as a guide to loading, wear and other usage limitations in normal industrial lifting chain service. 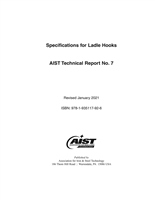 This technical report covers new laminated ladle hooks, which are rectangular in cross-section and are used primarily for lifting hot metal ladles. Hooks rigidly attached to a spreader beam are not discussed in this report. Hot metal cars (a.k.a. torpedo cars, sub cars, bottle cars, Pugh cars, mixer cars) are used to transport molten iron from the blast furnace to the steelmaking facility. They are vital to the everyday operation of integrated steel manufacturers. 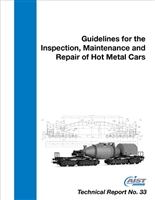 The purpose of this document is to provide guidelines for inspection, maintenance, and repairs of Hot Metal Cars. 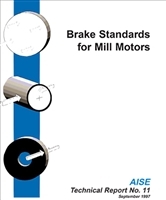 The current edition of this technical report addresses the entire scope of friction brakes that are spring set, including shoe, caliper disc and motor mounted plate brakes for crane applications. AISE Subcommittee No. 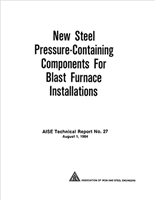 27 on New Steel Pressure-Containing Components for Blast Furnace Installations was formed in 1974 to establish criteria for the design, fabrication and construction of new steel pressure-containing components for blast furnace installations. This technical report has been prepared by a committee consisting of designers, owners and manufacturers who considered the current technology available. It is intended to present a set of criteria for the design, material selection, fabrication, erection, inspection and testing of new steel pressure-containing components used in blast furnace installation. The intent of this report is to provide a set of criteria for the material selection, design, fabrication, erection, inspection, testing, maintenance and alteration of certain BOF components. This technical report covers the specifications for design of new ladles with circular, oval or obround cross-sections and with welded or riveted construction. 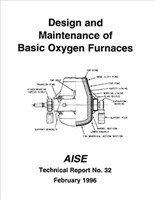 It also addresses the selection of materials and structural design methods for primary ladle components and also the use of high-strength refractories to assist in obtaining optimal ladle life and minimal ladle repair. The 2018 edition of AIST Specification for Electrical Overhead Traveling Cranes for Steel Mill Service (Technical Report No. 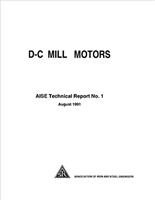 6) is the 10th revision since the first AISEE General Crane Specification was published in 1910. 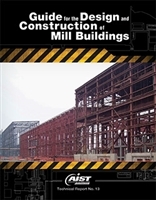 Authored by crane owners, engineers, manufacturers and equipment suppliers, the consensus-derived technical report outlines experience-proven best practices, maintenance friendly designs, and flexible and practical options for crane applications in the steel mill and related facilities. Since its most recent update in 2005, TR-06 has gained wider acceptance in environments that demand overhead cranes operate in difficult conditions, including contributors and users from not just the steel industry, but also aluminum, shipping, and the military, among others. Please note: this is a downloadable PDF version of TR-06. Download will be available after purchase.